TIMES SQUARE NYC FLOOR MAT home decor, jewelry, decor, decorations, electronics, fountains, floor mats, art glass, vases, garden essentials, fireplace screens. The electric ambiance of New York City's Times Square can be yours everyday! 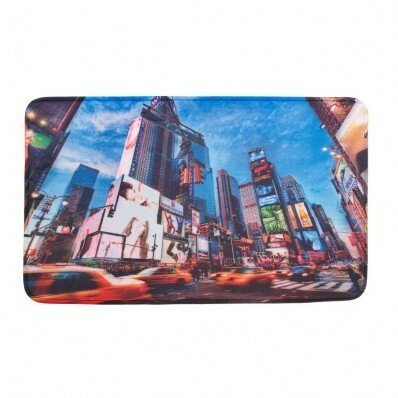 This polyester mat features a digitally printed scene of tall buildings, bright lights, and racing taxi cabs that will make you feel like you are in the center of the city. Machine wash cold; do not bleach; do not iron; do not tumble dry; do not dry clean. Material(s): POLYESTER POLYURETHANE MEMORY FOAM FELT. Dimensions 29" x 17" x 0".